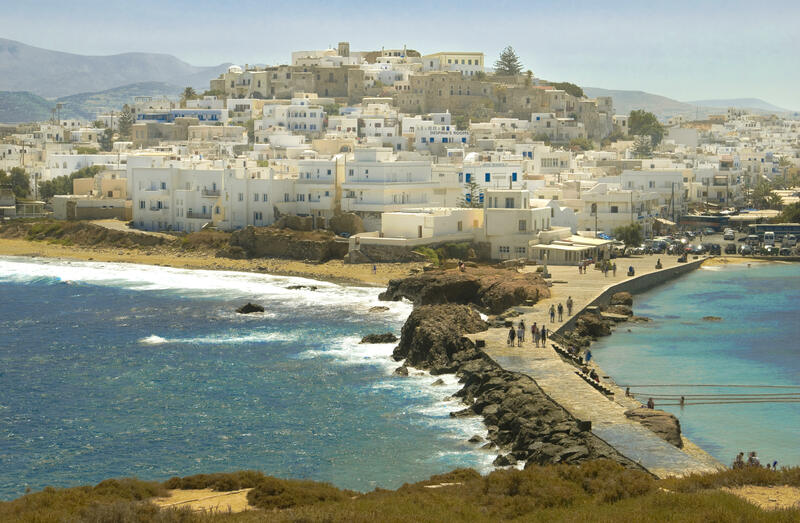 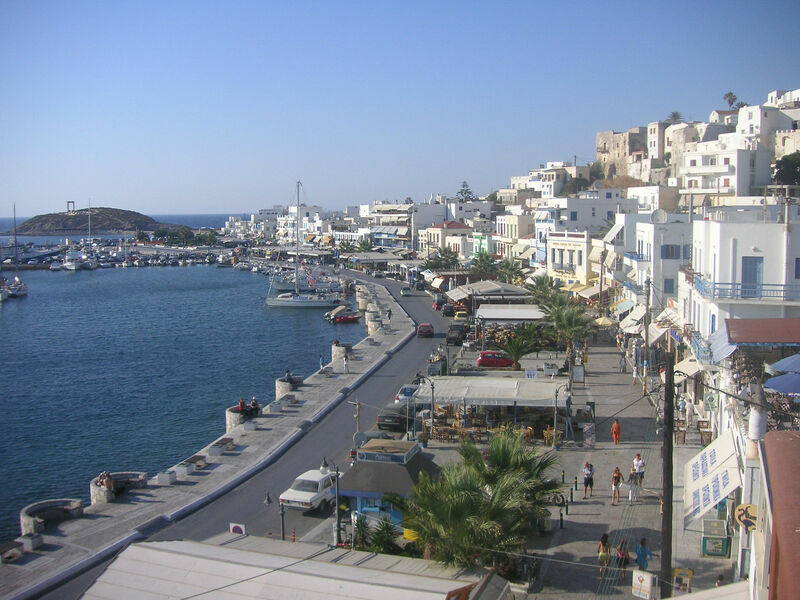 Naxos, the largest and most fertile of the Cycladic islands, lies almost at the centre of the Aegean. 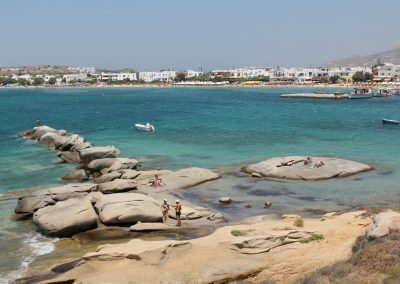 Meadows running down to vast beaches, cliffs sinking suddenly into the sea, rocky mountains side-by-side with fertile valleys, abundant springs and streams these are just some of the features of a natural environment marked for its variety. 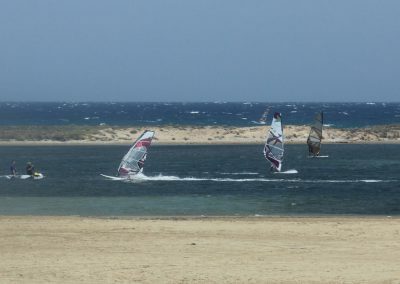 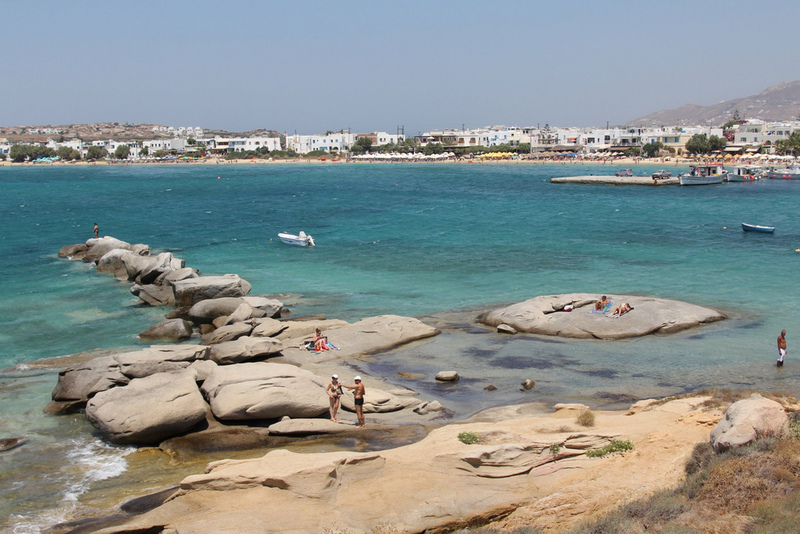 The coastline of Naxos is abrupt on the south side and more sheltered to the west, with numerous inlets and sandy beaches. 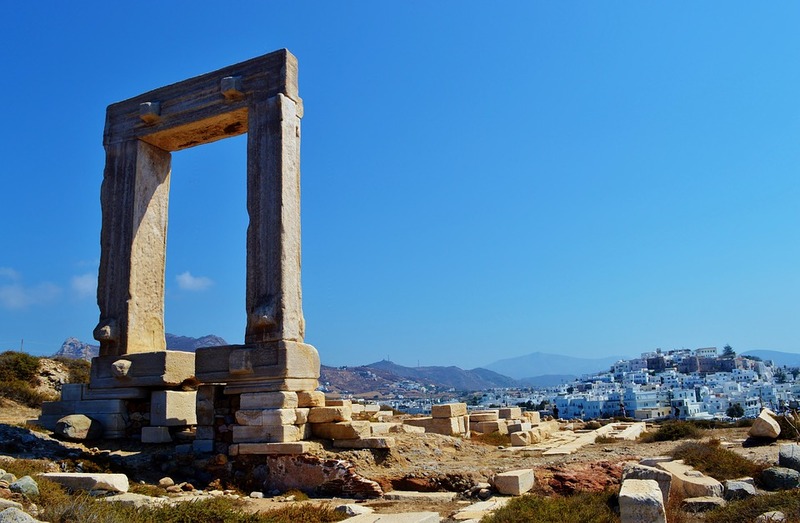 The island is first heard of in the myths and then mentioned through-out every period of history, though it was at the peak of its glory during the period of the Cycladic civilization. 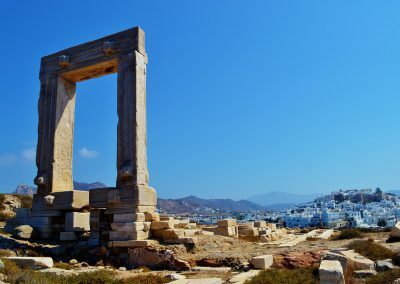 Naxos or Hora stands on a naturally amphitheatrical site on a hillside on the north-west side of the island and is one of the most attractive towns in the Cyclades. 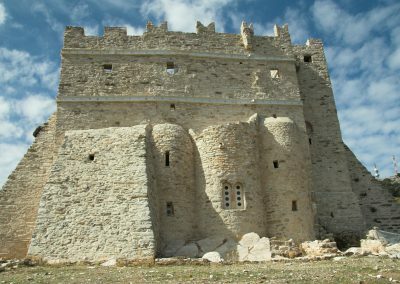 As the visitor walks from the harbour high up to the Venetian casde, he will be struck by the beauty of the narrow winding lanes and the old stone houses lining them. 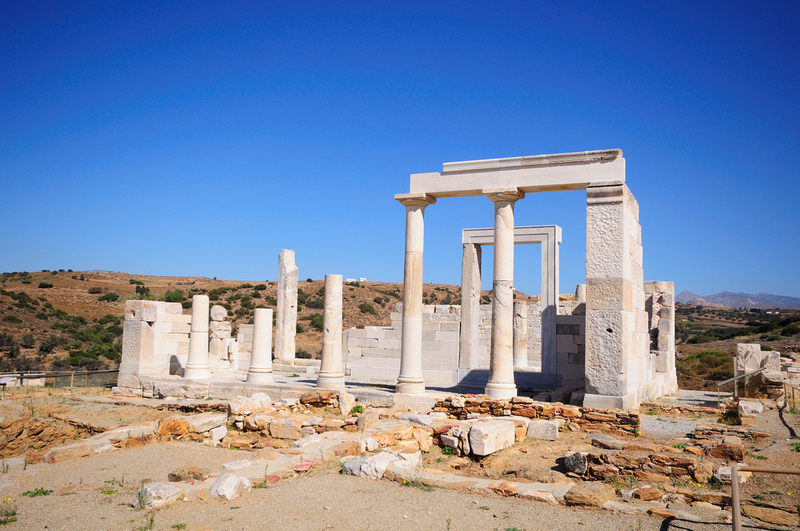 Interesting monuments from various periods are to be found all over the town. 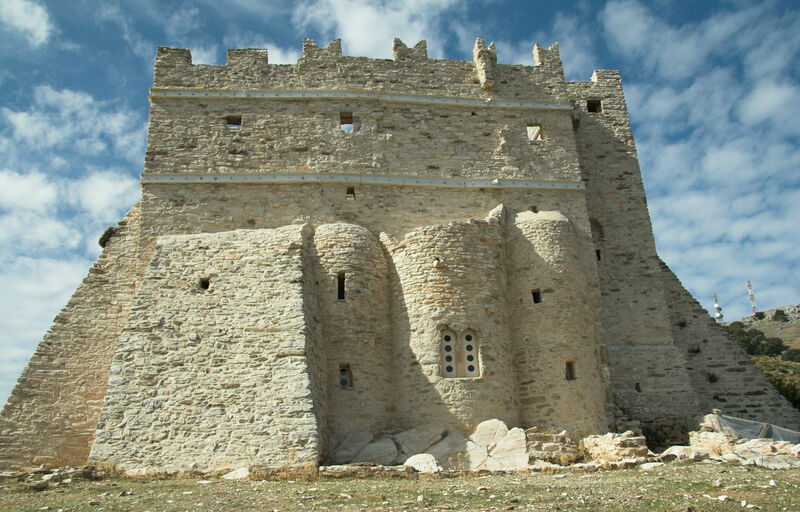 They include fme Byzantine churches, the castle itself (with its tower and battlements), and traces of Mycenean buildings in the spot known as Grota. 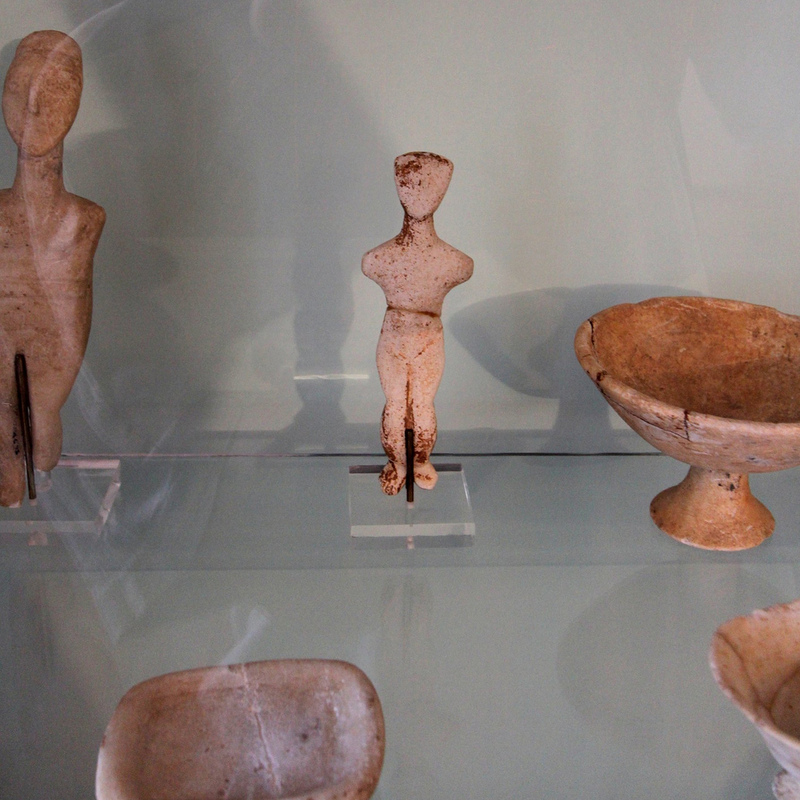 The Archaeological Museum of Naxos has some notable exhibits. 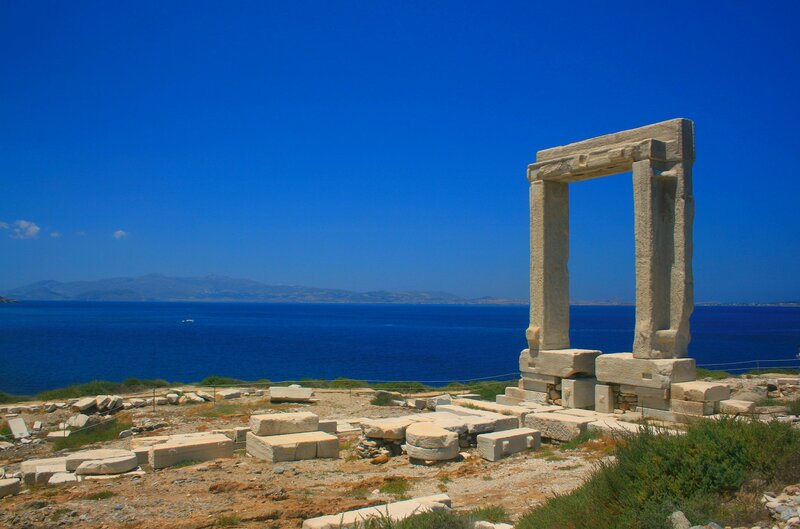 Given that traces of Greek antiquity are to be seen everywhere, each part of the island has something of interest. 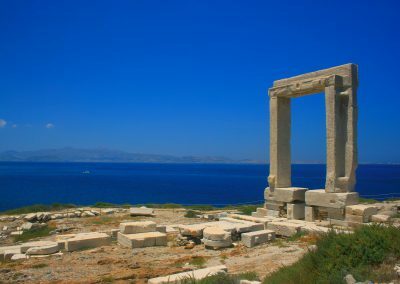 Near the pretty coastal village of Apolonas, for instance – on the north side of the island – is a half-finished outsize “kouros” (statue of a youth), dating from the 6th century BC, still lying in the marble quarry where it was abandoned. 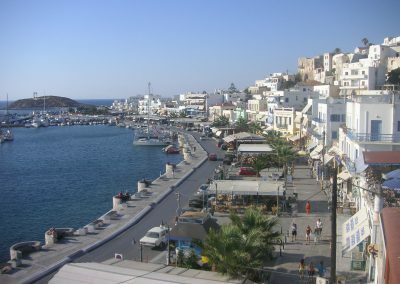 Another such statue can be seen at Melanes. 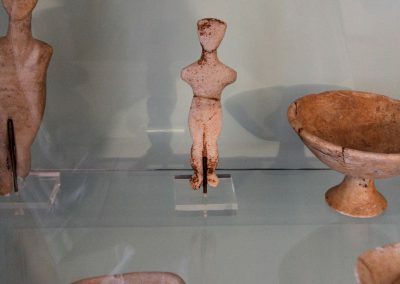 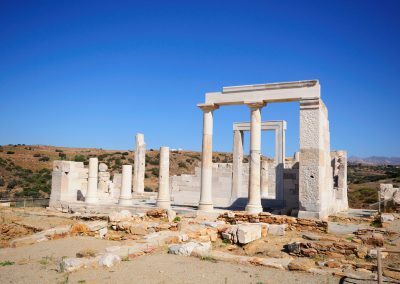 An interesting archaeological museum is to be found at Apirathos, a village where a number of strange customs and habits have survived. 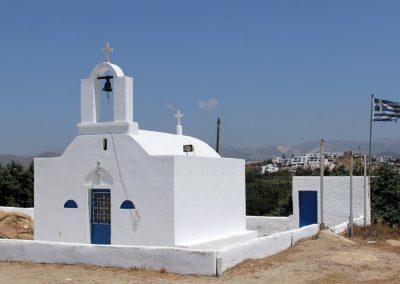 Among churches of interest are those of Our Lady “Protothroni” at Tragea and Our Lady “Filotitissa” in the village of Filoti. 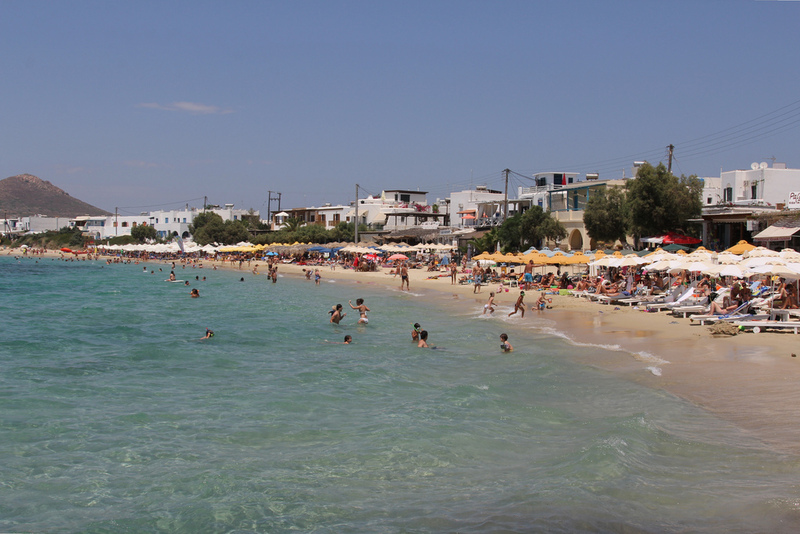 There are good swimming beaches at Aghios Prokopios, Mikri Vigla, Kastraki, Alikos, Pirgaki, Aghiassos (on the west side), Apolonas, Psili Amos, Panormos, Pahia Amos and elsewhere. 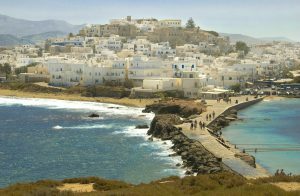 The superb beaches of Naxos, its attractive villages and its wealth of monuments draw thousands of visitors to the island each year. 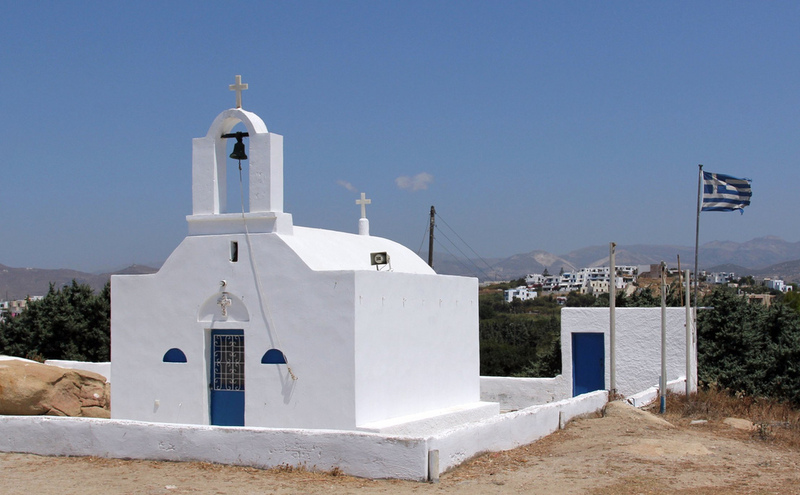 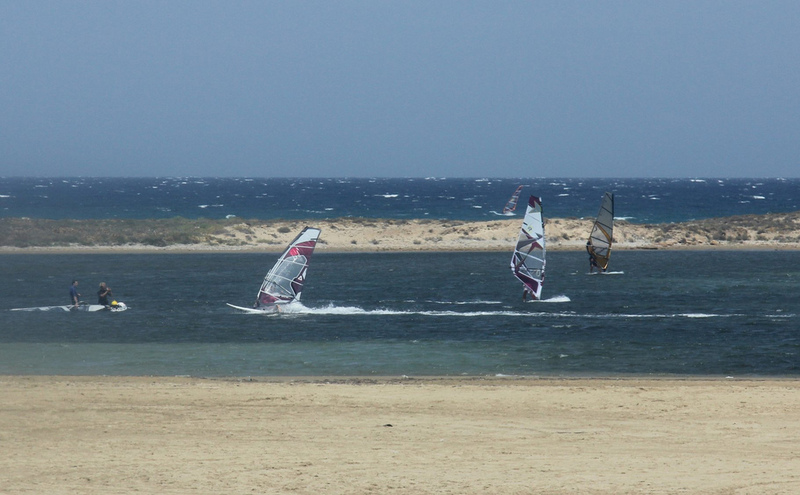 The good tourist amenities in Hora make it easy to tour the charms of the island.